On Thursday, September 13, 2018 community members took over the Kent County Commission Meeting to stage a "People’s Commission," which heard public comment and "voted" to end a controversial contract between the Kent County Jail and Immigration and Customs Enforcement. 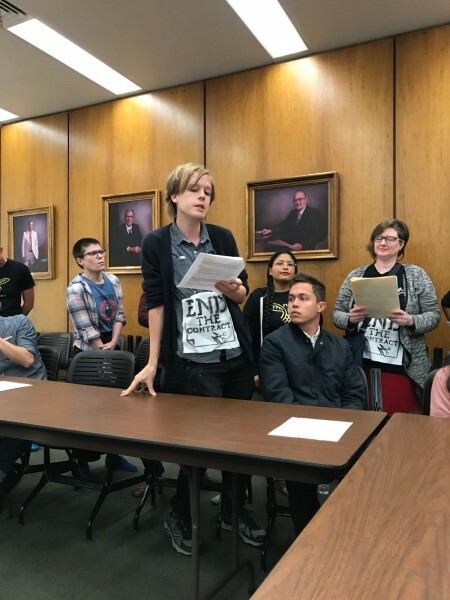 Concerned residents again demanded that the Kent County Commission end the contract with ICE to, as they put it, "stop taking money to hold our immigrant neighbors for their deportation." The Kent County contract with ICE was first signed in 2012 and renewed in 2015 - it allows the Kent County Jail to receive $85 per day to hold undocument immigrants for ICE (Immigration and Customs Enforcement) when they are brought in on non-immigration offenses - often something as simple as a traffic violation compounded by an expired drivers' license, since Michigan no longer allows undocumented people to receive drivers' licenses. Kent County earned over $17,000 from the contract in 2017, holding a total of 185 immigrants for ICE officials. At that moment several people stood up in the back of the area, representing what they called the People’s Commission. Organizer Amy Carpenter, acting as the Chair of the People’s Commission, called the People’s Commission meeting to order. “We are here to listen to the public about the Kent County Jail contract with ICE. We represent the people of Kent County as we actually are! And we want to hear from the public - tell us - is this contract between ICE and the Kent County Jail hurting our community?” The crowd responded, "Yes!" As the People’s Commission continued, Kent County Commission Chair Jim Saalfeld suspended the county meeting, and the People’s Commission meeting took over the Commission Meeting Room. The Kent County Commission was moved to a private room at 320 Ottawa Ave., and a member of the public who tried to enter was told the meeting was only for county employees, which some say is a violation of the Open Meetings Act of the State of Michigan. 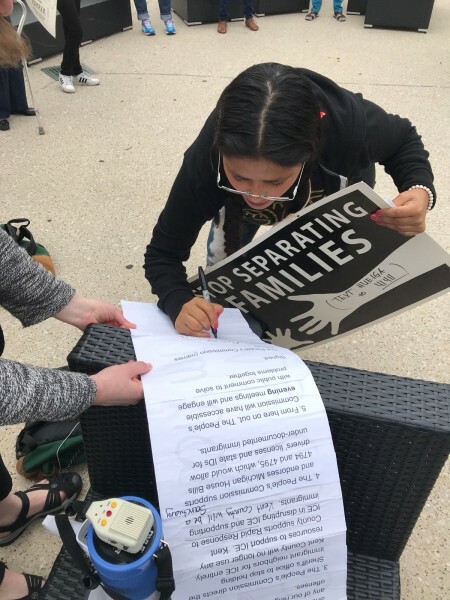 Members of the immigrant community shared their stories of fear due to the contract threatening separation of their families. 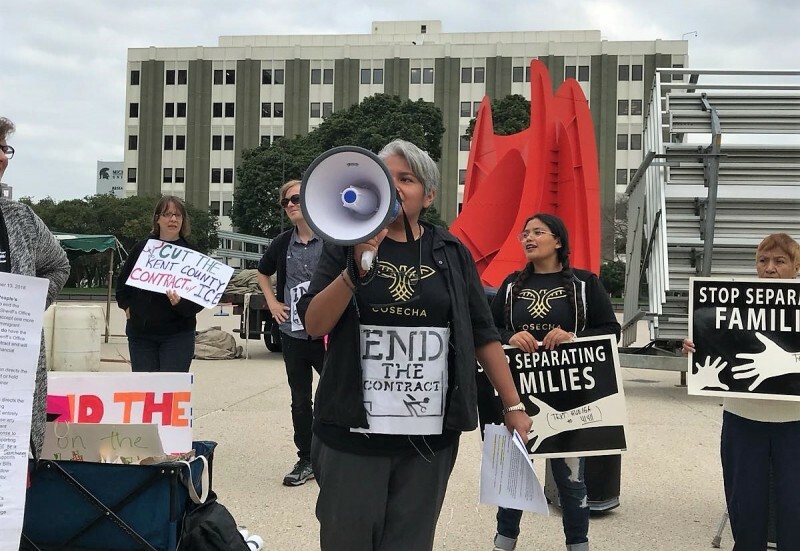 The People’s Commission - made up of Carpenter, LaDonna Norman, Alejandra Primavera, Gema Lowe, Dana Knight, and Sergio Cira - continued to act their roles and asked probing questions about the effect of the contract, the role of ICE, and the damage done to Kent County residents because of this contract. Members of the public shared data about the abuses committed by ICE against people in detention, including sexual assault. There is evidence of over 33,000 complaints registered between 2010 and 2017, with only a small percentage being investigated. Sarah Doherty, an organizer with GR Rapid Response to ICE, shared data from the ACLU. Subjected a 16-year-old girl to a search that ended in a sexual assault which was too graphic to describe here. JR Martin also shared some statistics for the People’s Commission to consider. “Kent County only made $18,000 last year from this contract. But it is estimated that immigrants contribute $3.3 billion a year to Kent County’s economy, which benefits the county. So it is much better for Kent County to not lock up our immigrant neighbors or hold them for ICE. The Kent County People’s Commission hereby votes in favor of ending the contract between the Sheriff’s Office and ICE. We cannot accept one more penny for holding our immigrant neighbors for ICE. We do have the authority to stop the Sheriff’s Office from continuing this contract and will pursue both legal and financial avenues to do so. The People’s Commission directs the Sheriff’s office to not arrest or hold our neighbors for minor offenses. The People’s Commission directs the Sheriff’s office to stop holding immigrant neighbors for ICE entirely. Kent County will not longer use any resources to support ICE. Kent County supports GR Rapid Response to ICE in their work of disrupting ICE and supporting immigrants. The People’s Commission supports and endorses Michigan House Bills 4794 and 4795, which would allow drivers’ licenses and state IDs for undocumented immigrants. From here on out, The People’s Commission will have accessible evening meetings and will engage with public comment to solve problems together. The event ended with dancing and celebration among the community. Amy Carpenter is a volunteer organizer supporting the immigrant community with Movimiento Cosecha GR and GR Rapid Response to ICE.